Initially there was tingling/numbness in index finger & thumb, then becoming painful. I'm going to try & keep it brief & to the point. It started approximately 7yrs ago. My index fingers & thumbs would become numb when in certain positions, i.e. resting my head on them, resting on handlebars of my bike, holding a phone. My left forearm, also seems to get stuck in certain positions. I admit I ignored it at first. Seeking medical help, I had MRI & EMG tests. The MRI showed pinched nerve @ C5 or 6. (my bad memory). It also showed arthritis in my neck. I'm 53, I get it. The EMG proved Carpal Tunnel. Not major enough for concern. The findings after tests & symptom descriptions also included some arthritis in my hands, particularly my left thumb. Anyway, I have increased weakness in my arms from the shoulders down. A few years ago, I could do 50 push ups, now I can't stand to have my hands in that position, let alone be strong enough to push thru 10. I have had increased pain in my hands, it is chronic. The majority of my pain is in my middle fingers of both hands & that makes the whole of my hand hurt. There is weakness as well & simple chores exasperate the pain level. I was given Neurontin & its relieved the tingling. I don't feel like the tingling was from Carpal Tunnel. I have seen Doctor, orthopedic doctor, neurologist, chiropractor, 2 hand specialist & had two sessions of physical therapy. Nothing has helped or relieved the pain.I keep asking my primary..HELP??? His last thought was perhaps a pain clinic. My medical history is 53 female. High BP but controlled w Availide. I am a bilateral BK since 19 due to Menigicoccal Meningitis. My arms were affected & almost amputated, but thankfully didn't happen. I wonder if the pain is due to a residual effect of that. My doctor thinks not, since the rest of me seems fine. So, that's it in a nutshell. What are your thoughts?? 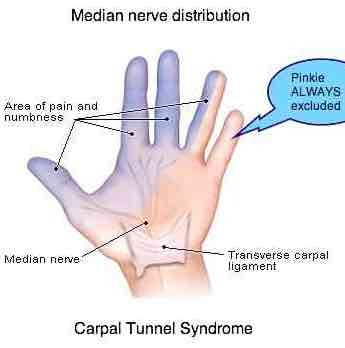 I'm so tired of the pain & with it the increasing loss of hand function. Who knows where this will go if I leave it untreated. I appreciate your time & look forward to your reply. Thank you for a very full description. It helps. Firstly, you can discount the carpal tunnel story. The thumb and index fingers are very specific for the C6 dermatome, and CTS would have included the middle and half the ring finger. That fits with the x-ray findings that you have degenerative changes at either C5 or C6; the lower cervical spine. 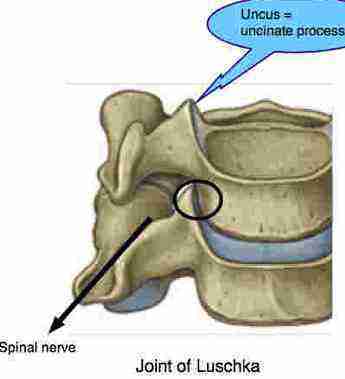 It's probably affected the joint of Luschka; an old whiplash injury. The mostly affected muscle in this syndrome is the triceps, hence your inability to do press ups. Do you know if anyone found a diminished triceps reflex? Because of the weakness in the muscle(s) it's likely that you would be prone to rotator cuff injuries in the shoulder, and others like tennis elbow. There's also a suggestion that you have unrelated arthritis in the fingers, but adding to the complication and pain. Did you go for a course of chiropractic treatment, without relief, or just one or two visits? This is a complex and painful condition; it's incurable but like many medical conditions, but can be greatly relieved. Would you be satisfied with 80% relief, say, and a monthly visit to the chiropractor? It's unlikely we can offer better. Interesting research at Harvard university showed that a chicken bones bouillon was more effective than medication in stubborn cases of inflammatory arthritis; try it. Massage your fingers daily, exercise them, and work hard to reducing the ratio of omega-6/omega-3 in your diet. In short, fatty fish, freshly ground flaxseed, real free range eggs if you can find them and walnuts. Try a different chiropractor; do your homework first. Find someone thorough and conscientious. If he or she doesn't use a reflex hammer, or look for that weak triceps, want to see your x-rays, then go elsewhere. A home traction unit, one used lying down, sometimes can bring great relief. A monthly sports massage of your neck, arm and hand would be helpful too. Miracles we do at once, but the impossible takes a rather longer; don't expect instant relief because you probably won't get it. Thank you so much for taking the time to give me such a detailed & informative response. I am definitely going to use your wealth of knowledge, experience & advice. Pleasure, Linda, such is my site. As a thank you one could purchase one of my Bernard Preston books on chiropractic! Chiropractic Help homepage»Bats in my belfry by Bernard Preston DC. » Thanks for the feedback.